Even though the US markets were closed on Monday we still expected a bit more zip out of them during the rest of this week. Especially considering what we said about the SPX in our last comment; “although, the Y ratio bandwidth is considerably thinner, it is still absolutely massive”. However, the ratios have been evolving, and we are seeing some good strengthening below the zone and some weakness above it, which is bullish. 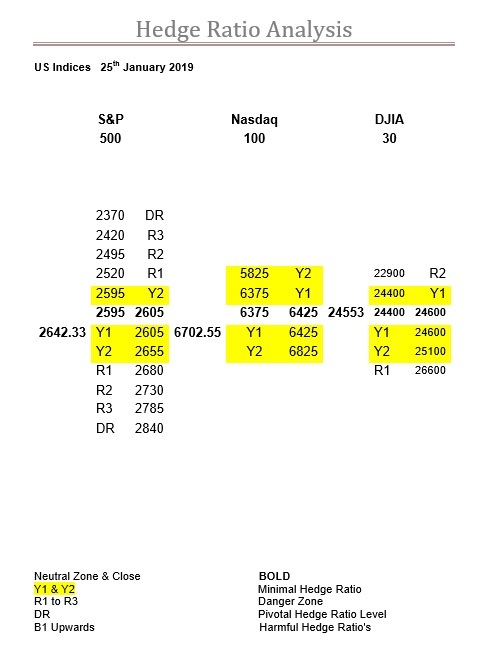 To highlight this, we have lost Y1 below the zone altogether, whereas above it Y2 now starts at 2655, and more importantly R1 slips from 2670 to 2680. This is significant, as on last Friday the intraday high was 2675.47, and it has noticeably not gone near there since. The way it is going also means we may well see a move up in the zone to 2645-2655, competing the bullish triumvirate. At the end of the day, we think it is the DJX that is going to be the deciding factor, so read what we say below first, then apply it to what may happen here in the SPX. As we said in the NDX; “so, don’t take those ice-skates off any time soon”. Activity remains low, but basically the benchmark is so small, by just achieving what they have done, it is actually rather pathetic. Nevertheless, it hasn’t stopped them adding about 50 new strikes. No problem if it stimulates interest, but it plainly doesn’t, so why bother? Y2 below the zone has come in a fair way, but at the end of the day it is still all Y ratio, so enjoy the skating. We certainly “bigged up” the DJX in our SPX comment above, and for very good reason. In our last comment about the DJX we mentioned; “therefore, for this expiry, 24600 is a really key level”. And the market must have been listening, as that very day, Tuesday 22nd, the DJX opened at 24607, which also became the intraday high. The next day it had a very aggressive test of its zone, peaking at 24700 and falling as low as 24307, both rather coincidentally being 100-points either side of their zones upper and lower boundaries. However, yesterday was a bit more precise, with the intraday high of 24626, and intraday low of 24422, making this a near perfect zone bandwidth test. To be fair, we would count both as zone bandwidth tests, so today fully expect a breakout. The bandwidth test alone suggests it, two in a row, double hint, and on top of all this, another test would be strike 3 anyway.